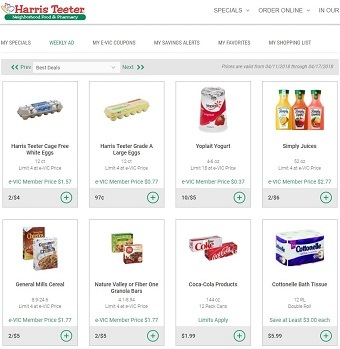 Check the latest Harris Teeter Ad, valid April 17 – April 23, 2019. Save with this week Harris Teeter Specials, digital coupons, organic produce sales and best deals. Shop for eveything you need for your kitchen meals including Silk or Wallaby Greek Yogurt, Starbucks Coffee, Boneless Ney York Strip Steak, Fresh Foods Market Hummus, Broccoli, Finish Dishwasher Detergent, Nature’s Path Organic Hot Cereal, Bertolli Pasta Sauce, Koop’s Organic Mustard, Single Truth Organic Popcorn, Organic Kale Salad, Green Kiwi Fruit, Organic Hass Avocados, Pomegranates, Olay Regenerist Cream, and more.